A good horse for one man may not be so good for another. That’s the way it was for an iron-gray gelding. But before explaining that, let’s begin at the beginning. 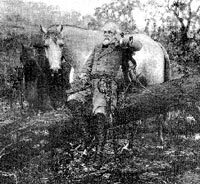 General Robert E. Lee, who led the Confederacy in the Civil War, wanted a dependable horse with plenty of stamina. What he got was stamina, nasty manners and a bit of an embarrassment. Gen. Lee’s first horse was Richmond, named in honor of the city and the people who presented the general with the bay stallion. While Richmond could certainly do the job, he was bad in the company of other horses, and the commanding officer didn’t like him. But it’s a little hard to get rid of a gift horse. So, as a true Southern gentleman, Gen. Lee rode the horse for an appropriate period of time, and then quietly had the horse sent back to the farm. Richmond was replaced by a roan gelding which had good manners, but not the stamina required by the general. Several times Gen. Lee had seen a gray gelding which he admired very much, but which was not for sale in the year of 1861. The horse went by the name of Greenbrier at the time. The name was chosen after the horse had won several ribbons at the Greenbrier County Fair in West Virginia. Originally the horse had been named Jeff Davis, after Jefferson Davis, at the time the Secretary of war in the Buchanan cabinet, and later to become the president of the Confederacy. Since the roan gelding was not satisfactory to Gen. Lee, a third horse was selected. This horse was a chestnut mare by the name of Lucy Long. The general became very fond of the mare, and called her “Miss Lucy.” She was about 15.1 hands, a good mover with excellent conformation and good legs. But like the roan gelding, she simply did not have the strength to withstand the rigors of long, forced marches. Miss Lucy broke down after two years of service to the general, and she was sent to a farm to rest. While on the farm she was captured by Union troops, but was found again after the war in a public riding academy. One of Gen. Lee’s friends bought the mare and had her shipped to the general’s home. There she remained as a pleasure horse for family members and friends. Miss Lucy, at age 31, was humanely put down. Still interested in the iron-gray, Gen Lee again tried to buy the horse in 1864. This time he was successful, paying $200—thereby giving a Capt. Broun a $25 profit. (Capt. Broun wanted to give the horse to the general, not because he didn’t like the horse, but because he so admired the general.) The gray was a very strong horse, as the Gen. Lee suspected. And he had a very fast walk. His trot was rather on the rough side, but much to the general’s liking. Gen. Lee always sat the trot. Gen. Lee’s eldest son thought the horse to be rough, unruly, and tiresome, and did most of his previous owners. Despite what others said of the horse, Gen. Lee called him “gentle, easy, comfortable”, and very willing to move out without urging. It was the horse’s readiness to go down the road which caused Gen. Lee to rename the horse, Traveller. Traveller carried the general everywhere during the remainder of the war, including to the surrender to Gen. Grant at Appomattox. After the surrender, Traveller carried the general home. The longest journey for Traveller after the war was the ride from Richmond to Lexington, about 110 miles, where Lee assumed the presidency of Washington and Lee College. Gen. Lee rode Traveller a great deal in the few years which followed. His rides included a weekly 11-mile one -way trip to Blue Sulphur Springs to see his semi-invalid wife. Gen. Lee suffered a fatal heart attack in the fall of 1870. Very shortly after the general’s death the horse which didn’t suit other men, but was so loved by the general, stepped on a rusty nail and contracted tetanus. There being no cure, Traveller was shot to prevent agonizing suffering.